If you head over to Pet Blogs United you’ll see Chloe, Moe and me in all of our humiliated bunny eared glory. You can join in the Blog Hop fun at Nola’s or Sugar’s! HAPPY HOPPY EASTER to you Buddy… you and YOUR PEEPS!!! 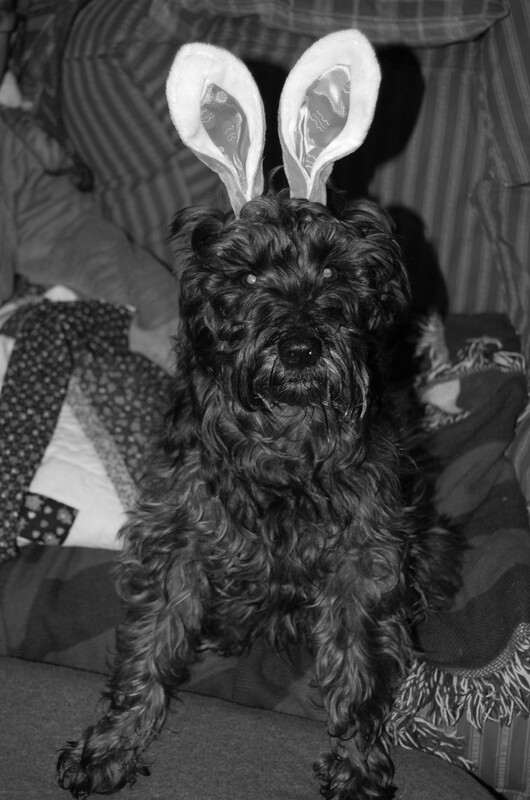 Happy Easter, Oskar. Hope you got lots of treats. Caren Gittleman recently posted..HAPPY, HOPPY, EASTER!! Bet you are the best looking bunny on the block! Happy Easter! Hippity Hoppity Happity Easter to you, Mom-Person and the whole family, Oskar! We hope that you and your family had a fabulous Easter, Oskar! Me love teh Eestur Bunnie!! Angel Keisha recently posted..Happy Easter! Glad we didn’t have to wear those Easter Bunny ears at our place! Happy Belated Easter. We are so late in reading Easter posts! I heard on the news just now that P&G are selling Iams.